Please enjoy using our on-line guide to planning and coordinating your wedding transport. If you take the time to read through the article and visit the links to relevant pages along the way it will prepare you for making informed choices about the style of wedding cars or limousines you want and how to determine which business to trust your booking to. Usually the choice of wedding transport follows the big decisions – picking your wedding date and booking the ceremony location and reception venue. If you have found this page before securing your venues make some notes or bookmark the page for later reference, but it will still be useful background research. If you are newly engaged or have a long planning timeline and have just started browsing you might like to spend more time with the first steps noted. When you are ready to make decisions you will have a good idea of the styles you prefer. 1 What do you like? 2 What is your wedding theme? Some girls have been engaged in this step since they were three years old and know exactly what they want. If you are open minded about your day and have a long lead time this step is fun and easy. You will be amazed at how many images you can find on the internet in a very short time. Start a Pinterest account (or a scrap book if you prefer) and collect wedding pictures of what you like. Have a Pinterest board for each element of your wedding – ceremony locations and settings, flowers, wedding dresses, reception venues and wedding cars of-course. Check out our Pinterest boards if you want a starting place or pin directly from our website if you are already active on Pinterest. The final step is to place the images that grab your heart into a board called My Wedding or The Best Wedding as you refine your decisions. Your professional photographer won’t need to be told what to shoot, however, if you give them your ten favourite wedding pictures from what you have collected as a guide to your tastes there is more likelihood they will capture the style you are hoping to achieve. Many brides choose a colour theme first, one for the bridesmaids and complementary colours for the decorations which sets a style guide for the wedding. Other couples choose a photographic theme first and let that direct their planning. Your wedding transport along with the architecture of the locations you choose will set the period theme for the photographic and video records you will gather on the day. 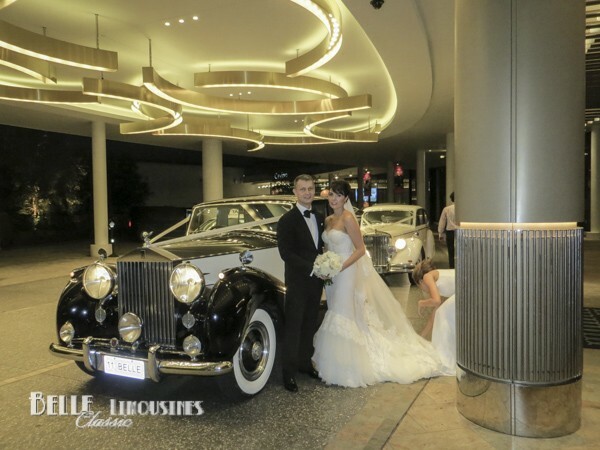 Belle Classic Limousines are sensitive to the the needs of various culturally themed weddings. Discuss your special needs, we frequently assist with special rates for extended wedding transport needs (of over six hours), weddings that involve transport over two days and changing passenger numbers through out the event. Choose vehicles that complement your wedding theme, ceremony location and reception venue. Your photographer should help you select photographic props and several locations near your venues that will help to build on the visual theme for your wedding albums. Search You Tube for videos of weddings at the locations you are using. It is a good way to see how others have set up the spaces and photo locations around the venues. Just as weddings are the bringing together of two individuals to make a couple, wedding day transport most often involves bringing the bride and groom from different locations to the ceremony. The mode of getting to the ceremony can vary greatly from couple to couple. For some it is often a demonstration of the individuality of the bride and groom by using strikingly different modes of transport, the bridal party arriving in a classic Rolls Royce Silver Wraith and the groom in a Jaguar Mk5 convertible. For others it is a well matched and coordinated fleet of vehicles. Either way the wedding procession has a long history in most cultures. Typically the groom, best-man and groomsmen arrive about thirty minutes before the bride to meet and greet the guests as they arrive. How many in the groom’s party? Groom, best man, groomsmen, pageboy? Some couples include the groom’s parents in this group on the way to the ceremony. How will they get to the ceremony? The bride and bridesmaids arrive at the start of the ceremony. They are traditionally escorted by the father of the bride, although it is common practice for the mother of the bride to be included these days. Bride, maid of honour, bridesmaids, flower-girls? Traditionally brides travel to their wedding with their father however many now include her mother in this group on the way to the ceremony. If the bridal party is preparing for the wedding within 10-15 minutes drive from the ceremony location the wedding cars or limousines can pick-up and deliver the groom’s party and then move on to the bridal party. Remember to factor in traffic conditions at the time of your wedding in your travel times and add five minutes for every pick-up and drop-off if you are planning a loop-de-loop. This strategy is only recommended for a patient bride because simple delays compound to affect both groups (someone has just gone to the bathroom, I forgot my speech, where are the rings? etc). or they need to return 10 minutes into the drive to the ceremony because “I forgot my speech, the rings, special cufflinks etc”. Its not usually the groom’s fault, remember his groomsmen are there too (end of lesson). Instantly the process is 25 – 30 minutes late. wet weather slows down the road speed and congests the roads (even without an accident on the route being taken) adding 10 minutes to each trip…. 3 x 10 = 30 minutes late…. 3 x 15 = 45 minutes late…. the longer the journey the greater the compounded risk. A separate short hire limousine or chauffeur car for the groom’s party will cost between $150 – $290 which is a good investment if it secures your wedding schedule. Using two wedding cars or a wedding car and limousine can provide transport for both groups to the ceremony with their own schedule. It also means that there will be sufficient seats to drive the wedding party to the feature photography locations and on to the ceremony. Add one or two seats to your total wedding transport needs for comfort. At a minimum the bride should have two seats (eg. a bench seat for the bride and groom). While this is advised, not all couples do, or need to add additional seats. 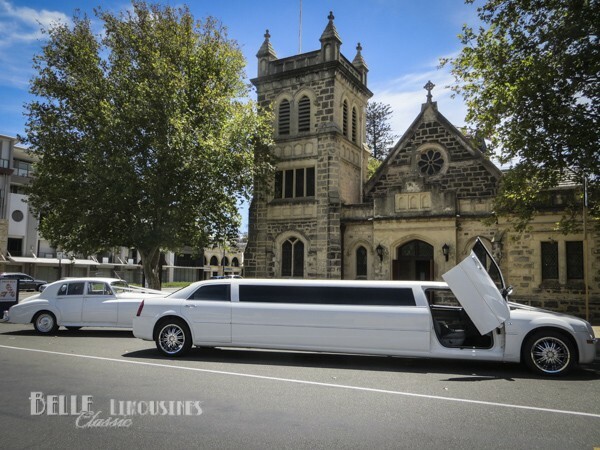 You know the size of your group – four ‘regular’ sized passengers fit in a classic car comfortably, however, we once had a bride book a six seat limo for six Fremantle Dockers players and the result was comical. Similarly extra tall or stout members of your group need some consideration. Please contact the office for advice if needed. Avoid long distance travel. We will assist with what ever your plans are for the day, however, to give you the benefit of our experience, the less distance that needs to be travelled the less likely you will suffer delays due to unexpected traffic conditions and the more time you will have to enjoy the highlights of your wedding day. If your chosen wedding venues are a long drive from home look at hiring an apartment in the vicinity of your ceremony location for the night before your wedding and preparation on the day. Read our article on having a ‘Pan B‘ in place for the trip to the ceremony. A few minutes planning ahead of the day can help to keep your wedding on schedule if something goes wrong on the day. This is especially true for loop-de-loop bookings. Following the ceremony family photographs are usually taken at the ceremony venue before the bridal party depart for location photographs and often to take some time out before the reception. During this period transport is usually provided for the wedding party only. It is less common for flower-girls and pageboys to be taken with the bridal party during this time and very rare for the parents to tag along. Photo locations are usually in close proximity to the ceremony and reception venues and the photo session is a good opportunity for the bride to relax before the formalities of the reception. How many people are to be transported in the wedding party? 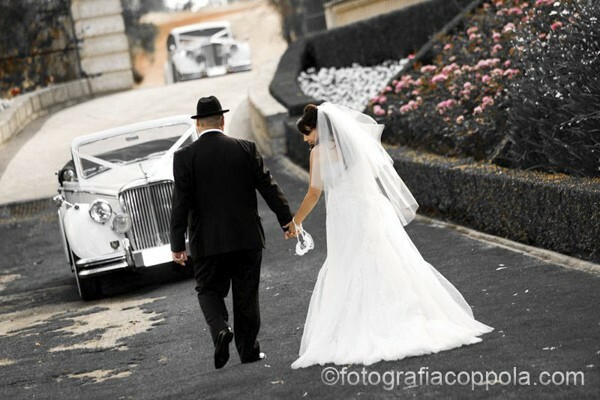 Often for smaller wedding parties the bridal cars are sufficient after the parents are left at the ceremony. The bridal cars are booked for the duration of the wedding. The grooms transfer to the ceremony only needs to be a short hire. For larger wedding parties the grooms transport to the ceremony is retained for the duration of the wedding as well. Even for couples planning an ‘all at one venue’ wedding it is common for the wedding cars or at least the feature bridal car to be retained for the duration of the photographic session. Many venues have a long walk within the venue to photo locations and others have the best photo locations a short drive from the venue. Did you know that Belle Classic Limousines is recommended by some of Perth’s leading wedding photographers including: A & C Photography, Absolute and Alive Photography; A Woman’s Touch Photography, James Burton Photography, DeRay and Simcoe, Elaine Elliffe Photography, Fotografia Coppola, Jemma Keech Photography, Prophoto, Erica Serena Photography, Kate Smeda Photography, Jason Soon Photography, Spoilt Weddings, Jason Tey Photography, Verge Studios, Warnock Imagery. Check out our galleries of their work by following the links. Don’t skimp on your photography time between the ceremony and the reception. From our experience it is great fun and the pictures will be cherished after the day. It is an opportunity for the bride to have some time out before the reception in what is a very busy day. Finally, in the rare case that there is a delay in your day (hair or make-up are late or too slow; organist at the church didn’t arrive on time; flat tire or a traffic accident that delays your car etc) it will be your photography time that gets cut. If you only allow 30 – 60 minutes for photos it may be lost. It is wise to include your end of night get-away at the time of booking. End of night get-aways can be added to your booking closer to the wedding date if you prefer, however, be aware that we offer only a limited number of end of night services each night (usually two to three cars). Even if you are not sure of your end of night destination, book our services early if you would like us to assist. Book your end of night transfer get-away in advance. With the explosion of Uber services many couples and their guests along with all the other Perthites on a good night out expect it will be easy to get a lift at the end of the wedding or event, so there is less pre-booking of charter vehicles. In reality weddings finish at around the same time that pubs, restaurants and events are also closing up so there is a peak demand between 11.00pm to 1.00am. When you consider that there is potentially 20-30 weddings on any Saturday night in Perth and another 20-30 weddings in the Swan Valley the available short call services still struggle to cope with the demand. When your times for the ceremony and reception are set and you are ready to schedule your day be generous with the times. allow 5 minutes for every time you are departing or arriving at a venue. You would be surprised how many times a group waits for 5 -10 minutes for someone who is making a last minute visit to the bathroom, looking for their glasses, speech, cufflinks etc. plan in at least 30 minutes extra time for your photography session. If your ceremony runs late you will loose this time, better to loose your extra time than your photography plans. If everything goes to schedule you will appreciate the relaxed photography session or just a short time out before the reception. add 10 – 20 minutes to your drive to the ceremony time. If there is unseasonal weather, a traffic accident, or major event causing road congestion then you are ahead of the game. If none of the above eventuate your limousines will be early and wait patiently for you until you decide to leave. Get your wedding cars to arrive an extra 10 – 15 minutes before your departure time. An extra $60, $90 (even $200 if you have multiple limos) in wedding car or limousine hire would seem like a good investment / insurance (in retrospect) to a bride who lost an hour of her wedding day due to unexpected delays due to the weather or traffic hold-ups. Yopur cannot foresee the weather on your wedding day, but you should plan for the worst possible conditions and laugh when it doesn’t eventuate. Now you are ready to make some decisions. Check out several vehicle combinations available from Belle Classic Limousines. You can look at the individual cars by following the picture links on the home page or the menu to the right on your computer or the bottom of each page on a mobile device. See lots of pictures of the cars at work in our galleries. There are also galleries for most of the popular wedding venues in Perth so you can make judgements about how they will look at your wedding. 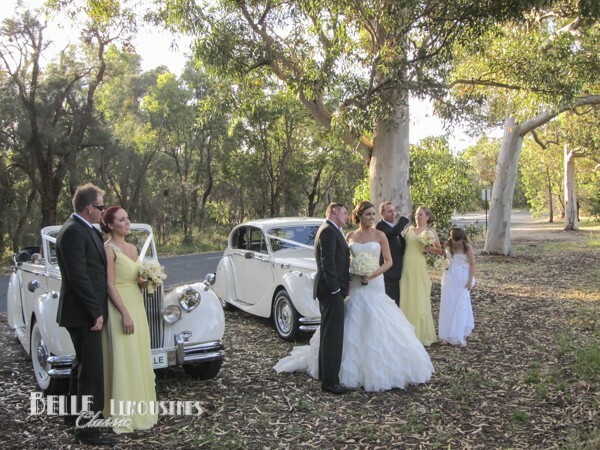 Belle Classic limousines Perth will assist you to plan your wedding transportation. Our free planning brochure will take you through the process of identifying and organising your transport requirements – locations, times, numbers of passengers – identifying and selecting appropriate vehicles – estimating the costs of various options. Every wedding is different – if the planning page doesn’t fit your day, call us, we’ll help with them all. 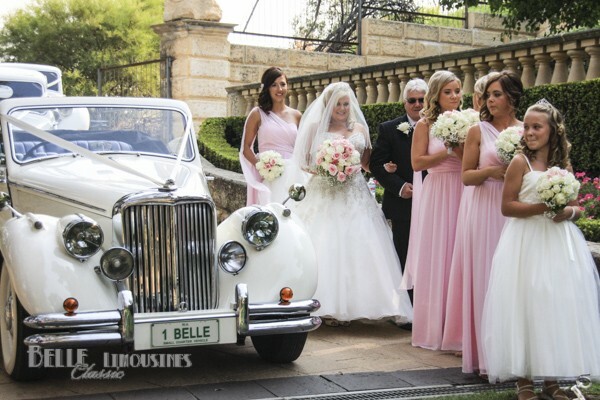 The friendly staff at Belle Limousines welcome inquiries about wedding transport planning. We offer obligation free advice and no question will be considered too stupid. Most couples are planning their first wedding and are flooded with often confusing and contradictory tips and instructions from wedding magazines, websites and friends. Belle assist with over 500 weddings every year – we see what works and what doesn’t work as well. You would probably be surprised by the variety of wedding ceremonies organised these days. Whilst most couples lean toward the traditional it is really anything goes.